Mr. Clyde McGrady, age 92 of Traphill, passed away Saturday, November 24, 2018 at Alleghany Memorial Hospital in Sparta, NC. Funeral services will be held 2:00 PM Monday, November 26, 2018 at Old Roaring River Baptist Church with Rev. James Pardue and Rev. Walter Hutchinson officiating. Burial will be in the church cemetery. The family will receive friends from 1:00 until 2:00 prior to the service at the church. 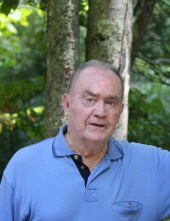 Mr. McGrady was born May 4, 1926 in Wilkes County to John and Mary Hutchinson McGrady. He farmed for twenty years raising chicken and cattle, then built and ran a Country Store on Longbottom Road in Traphill for twenty six years. After retirement, he volunteered at Stone Mountain State Park as an Interpreter at his Grandparents Homestead. Mr. McGrady was a member of Old Roaring River Baptist Church. In addition to this parents, he was preceded in death by his wife Hazel Sidden McGrady, two brothers; Vaughn McGrady and Glenn McGrady and two sisters; Dawn McGrady Osborne and Pearl McGrady Brown. He is survived by a daughter; Tammy McGrady of Traphill and fiancée Sid Carrier and daughter Megan of Piney Creek, two sons; Kenny McGrady and wife Denise of Traphill and Dennis McGrady and wife Janice of Traphill, two sisters; Ella Mae McGrady Vires of Bristol Tenn. and Esther McGrady Burnette and husband Bill of Columbia SC and two brothers; Carl McGrady and wife Reveley of Bristol Tenn. and Charlie McGrady of Indian Trail NC. Flowers will be accepted or memorials may be made to Old Roaring River Baptist Church Cemetery 11156 Longbottom Road Traphill, NC 28685. To send flowers or a remembrance gift to the family of Clyde McGrady, please visit our Tribute Store. "Email Address" would like to share the life celebration of Clyde McGrady. Click on the "link" to go to share a favorite memory or leave a condolence message for the family.